If you live in North America or Asia and order 3 or more items on your order you get FedEx shipping for free. If you take advantage of our free shirt promotion (see below) you get a free shirt and free FedEx shipping everywhere. Use our buy 4 get 1 free promotion on your first order and at first we will FedEx only one "test shirt" at first so you can confirm your measurements. You will launder the shirt and try it on. In our shipping confirmation e-mail we provide a link to the "proper fit" page on our site so that you can check the fit of your first shirt compared to what is recommended as "proper fit". What determines proper fit or comfortable fit is always up to you, the page is only a guideline to help assist you with that decision. You will then send us an e-mail telling us the shirt fits fine or providing us with feedback on any necessary corrections we need to make before we ship the remaining shirts. If the test shirt does not fit properly, we will make a replacement shirt free. 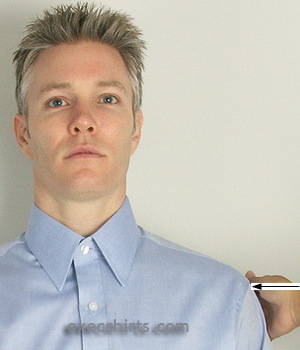 Even if your initial measurements are wrong you can have custom dress shirts RISK FREE! 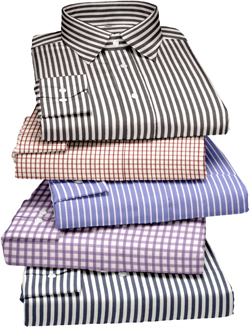 How it works is that you will add 5 dress shirts into your basket when you order, the system will automatically give you the least expensive shirt free, and we will recognize on our end that your account is for a new customer and automatically only send you one shirt to "test" your measurements. You can use either your standard size or custom measurements on your order. You can also define your torso and what kind of cut you want on your shirts; such as "regular", "athletic", "thin", "husky". Those options are available whether you take your custom measurements or use a standard dress shirt size. For more information on this click on the "Shirt Sizing Info" button in the header above. On any order when you buy 5 shirts your 5th shirt is free. You can follow this same formula in any increments of 5 shirts that you buy. You do not have to do anything, the system will automatically give you the least expensive shirt on your order for free (per each 5 shirts). You can use this promotion without taking any measurements. 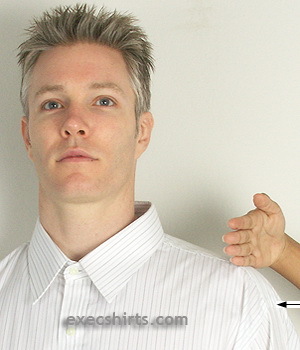 In the past customers have ordered their "test shirt" using their standard measurements (e.g. 16/36), and then corrected their measurements to get true custom dress shirts. We sell to Big Men & Tall Men at the same low price! In addition to the free shirt, we will also automatically upgrade your purchase to Federal Express Shipping for free.